Preheat oven to 350 F. Grease cans with butter, lightly dust with your favorite all purpose flour blend or sweet rice flour (shaking the excess free) and place a small round of parchment paper at the bottom. Set aside. In a small, heatproof bowl, combine hot cream with chocolate and whisk well until the chocolate is completely melted. Allow chocolate ganache to cool slightly. Combine sour cream, egg yolk, oil and vanilla in a small bowl, mixing well. Add the ganache and whisk well to blend. Whisk together flour blend, sugar, baking soda and salt in a medium sized mixing bowl. Add the liquid ingredients and stir well until just mixed. Evenly divide the batter between the two prepared baking cans, spooning the mixture carefully and smoothing any drips with a spatula. The batter will fill each can about 1/3 of the way. Place cans on a baking sheet and bake for 30-35 minutes, or until a toothpick inserted into the center of each cake comes out clean. Once fully baked, remove the baking sheet and cans from the oven. Place the cans upright on a wire rack to cool for 12-15 minutes. Run a sharp knife along the inside of each can to loosen the cake, then invert. Stand the cakes upright on the wire rack to cool completely, another 10-15 minutes. In a small bowl, combine caramel sauce, toasted coconut and chopped pecans. Mix well. Reserve 2 Tbsp in small bowl. Once the cakes have cooled, cut them in half horizontally, creating two layers. On a serving plate or small cardboard round, place the bottom half of each cake, cut side up. Spread a layer of the caramel coconut mixture across the top of each bottom piece, dividing the mixture evenly between the two cakes. Place the top layer of each cake over the filling, frost with your favorite chocolate frosting. Place 1 Tbsp of the reserved caramel coocnut mixture on top of each cake, creating a decorative frosting border around the top (see above photo), and voila! 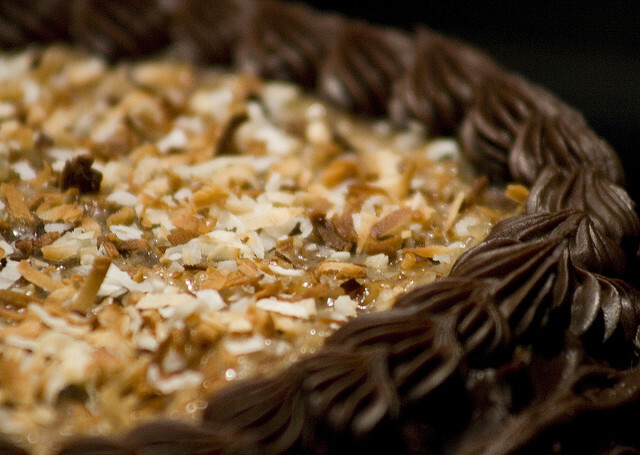 Funny story about German Chocolate cake. This 100% American recipe was created in 1852 and named for Samuel German who developed a dark baking chocolate for Baker's Chocolate Company. 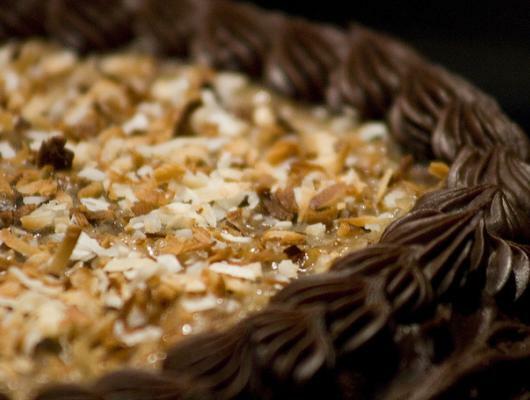 The defining characteristic of this cake, however, is its filling: toasted coconut, toasted pecans, and a custardy-caramelly liquid to hold it all together. This decadent recipe is easily my favorite ever cake and now that it is both gluten free and single serving! Make sure that you have 2 14-14.5 oz cans that have been emptied, their labels removed and scrubbed clean inside and out. It is also super important that you use a can opener that leaves a smooth, flat edge or you're going to have a riot of a time trying to get the finished cakes out! Addititionally, I prefer to use Jules Gluten Free Flour blend for baking -- of all the flour blends I have tried over the years, this is my favorite cake-baking flour blend. I am obsessed with Somebody's Mother's Caramel Sauce -- gourmet, gluten free and oh-my-god-delicious! I also I love David Lebovitz's chocolate icing recipe - it's rich, delicious and perfect for icing. Adapted from Small Batch Baking.